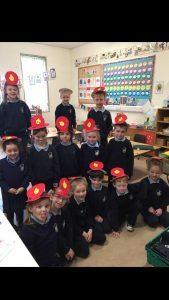  » Senior Infants » You&apos;re currently reading "News from Ms Livingston’s Class"
Welcome to Ms. Livingston’s Senior Infants. This month, our Aistear theme was People who help us. We learned all about people in our community such as firefighters, doctors, nurses, dentists, lollipop ladies, paramedics, lifeguards and more! We performed two poems at junior assembly, one about how firemen help us and another about the gardaí. We all dressed up in our Irish colours for St. Patrick’s Day! 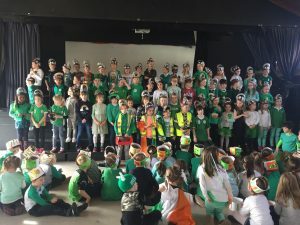 We looked at the St. Patrick’s Day parade and also how other countries celebrate it around the world. We went on a Spring nature walk around the school grounds. We recorded any signs of spring. We found a lot of daffodils. We also saw lots of different flowers which some classes had planted in Senior Yard. We used our five senses while on our walk. We could smell lavender from the school garden. We also could hear birds chirping. We also planted our very own seeds from the Incredible edible programme. 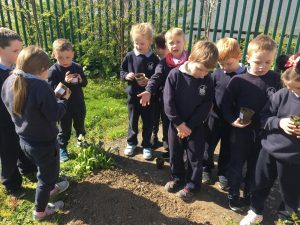 We first planted the seeds in small containers in our class. Some of the food we planted were turnips, lettuce, carrots, potatoes, strawberries, and chives. 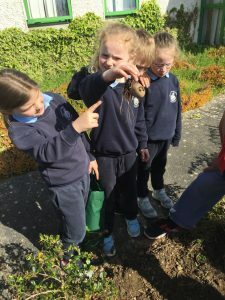 When they started to sprout in the pots, we moved them and planted them in the garden. We hope to see them grow even more! Senior Infant Science Trip! Hard at Work in Ms. Woods’ Class!